These are Shannon ionic radii. Image showing periodicity of the chemical elements for ionic radii (Shannon) for tetrahedral M(III) ion in a periodic table cityscape style. 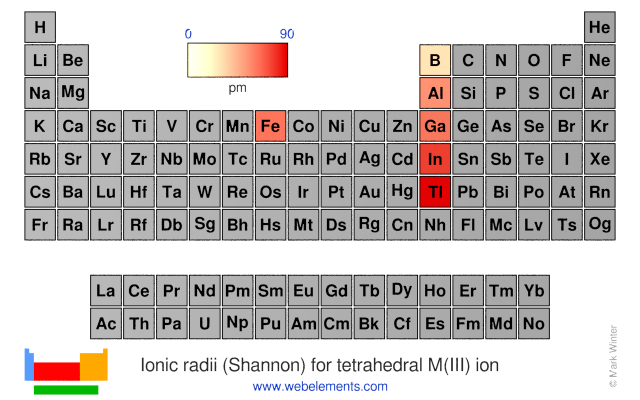 Image showing periodicity of the chemical elements for ionic radii (Shannon) for tetrahedral M(III) ion in a periodic table heatscape style. 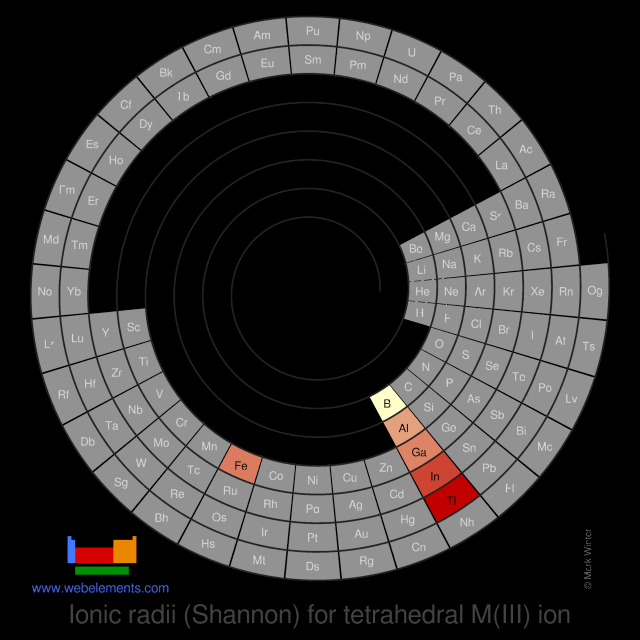 Image showing periodicity of the chemical elements for ionic radii (Shannon) for tetrahedral M(III) ion in a spiral periodic table heatscape style. 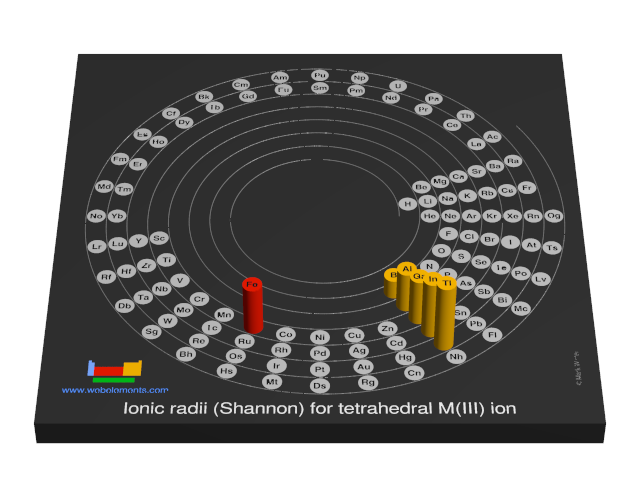 Image showing periodicity of the chemical elements for ionic radii (Shannon) for tetrahedral M(III) ion in a 3D spiral periodic table column style. 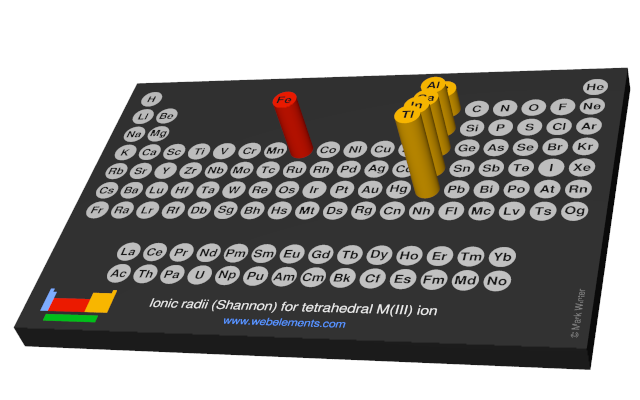 Image showing periodicity of the chemical elements for ionic radii (Shannon) for tetrahedral M(III) ion in a 3D periodic table column style. The "effective ionic radii" quoted here assume that the ionic radius of F- is 133 pm and that of O2- is 140 pm. Values depend upon the coordination number and for d-block metals whether or not the metal is in a high or low spin state. Older "crystal ionic radii" are based upon a radius of six-coordinate F- = 119 pm and are 14-18% larger than effective ionic radii. R.D. Shannon, Acta Cryst., 1976, A32, 751. R.D. Shannon and C.T. Prewitt, Acta Cryst., 1969, B25, 925. R.D. Shannon and C.T. Prewitt, Acta Cryst., 1970, B26, 1046.